It’s a wonder that luxury watch brands tend to focus mainly on the men’s market, when time is of the essence to everyone— gender aside. 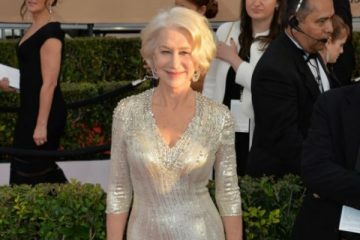 While there’s a seemingly endless database of luxury timepieces for men to choose from, the options are not as wide for women. That said, if you’re on the hunt for a high-end women’s watch for either yourself or a special lady friend, there are only a few labels you should look towards to get the same quality that is found in those men’s pieces that look like they should be behind glass at a museum at all times. I searched high and low for those timepieces, and found the best of the best women’s luxury watches over $10,000. The classic Lady Diver watches by Ulysse Nardin feature steel and rubber, and at around $6,600, are not quite up to par with their special edition watches in the same line. For $15,000 and up you can get on-trend by adding your favorite color in a bright hue. I don’t know about you, but I’m totally on board with luxury brands adding color to their products, straying away from the idea that luxe objects need to exude seriousness. 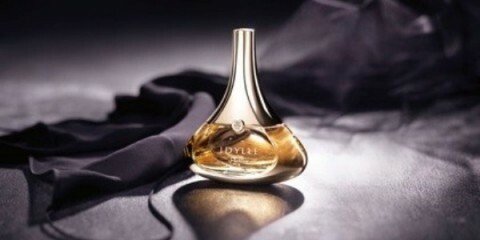 High-end can be fun, too, and I think that including a pop of color adds a personal touch to your luxury item, as well. 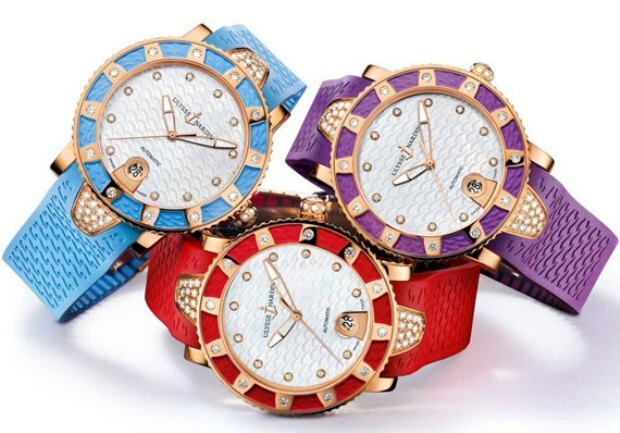 Ulysse Nardin’s Lady Diver watches come in purple, red, blue, and yellow. $15,000 will get you a 40 mm stainless steel case with colored bezel and a mother of pearl dial set with diamonds and sapphire crystals. If you want to step it up a notch, just replace the stainless steel case for rose gold for around $20,000. Both styles feature self-winding movement, an exclusive rubber bracelet in your favorite hue, and a deployant clasp. The next women’s luxury watch comes from a veteran in the business: Harry Winston. The label’s Ocean Lady Zalium Watch’s rubber band gives it a sporty look; however its diamond-studded dial brings it to a luxe level. Zanium, a blend of zirconium and aluminum, is a material that is signature to the Harry Winston brand, and is said to be hypo-allergenic and resistant to corrosion. It also has the added perk of being a lightweight metal; however I predict that the 36 mm case’s two rows of diamonds and sapphire crystal case-back counteract that feature. The ladies chronograph sells for upwards of $28,000, and has an automatic movement with a Swiss quartz movement on the inside that results in just the time and minutes being outwardly displayed. If diamonds are your thing, the Cat’s Eye Tourbillon by Girard-Perregaux is for you. 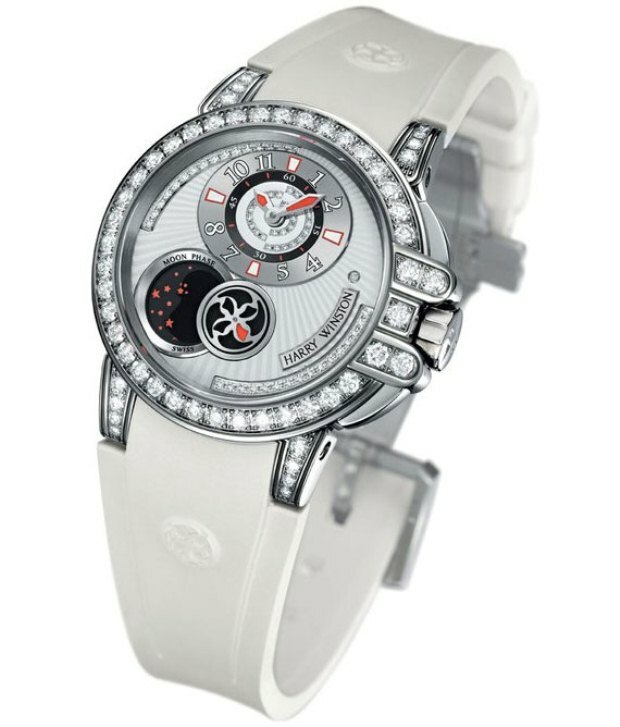 This luxury watch sports a feminine design that has a narrow, oval-shaped face that is characteristic of the collection. The entirety of the case and face are set with baguette-cut diamonds— 287 of them to be exact, which amount to almost 20 carats. Girard-Perregaux doesn’t use just any old diamond— over 700 hours of work were put into the strict selection, precise cutting, adjustment, and setting of every stone to make this intricate timepiece. Even the case’s crown is set with twelve more baguette-cut diamonds and adorned with a special rose-cut diamond. It’s no wonder the price for this impressive haute joaillerie watch is $490,000. The Open Magic Watch comes from a label that we haven’t covered before, however this watch certainly makes its presence known. DeLaneau calls itself “the jeweler of watches,” and from the looks of the Open Magic model, I’d have to agree. The slender, bracelet-like watch features a gold coil that connects to a satin strap. Its Bell Époque-style case features up to 5 carats of diamonds, (depending on the style) that protects a black onyx and mother of pearl dial. At an astounding $1.5 million, DeLaneau’s Open Magic Watch’s dauphine-style hands and diamond hour markers complete its luxe look. The priciest model on our list is brought to you by Hublot, a pillar brand in the luxury watch industry. The Big Bang style was first introduced in the form of a men’s watch, which gained copious amounts of attention for its overwhelming diamond-studded make. The brand’s version for women is just as impressive, with a more delicate touch. 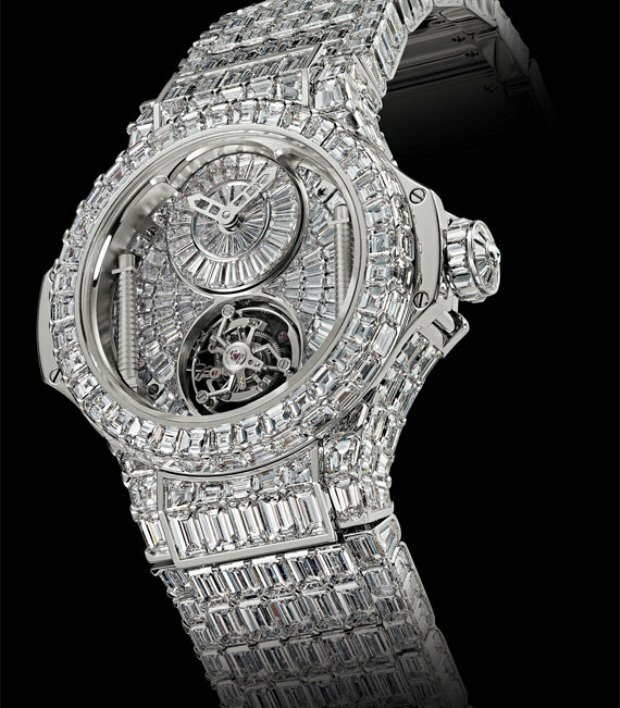 The Hublot Big Bang Ladies watch made its debut earlier this year at BASELWORLD in Switzerland. 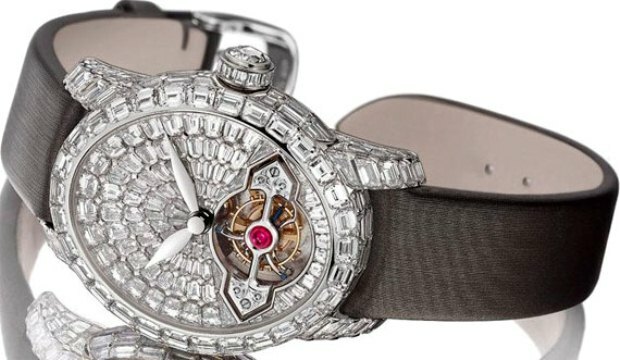 The bejeweled timepiece has an astounding 1,282 diamonds (that’s more than 300 carats-worth) and, at $5 million, is Hublot’s most expensive timepiece to date.